One of our favorite things about traveling to trade shows each month is the time we get to spend visiting the local smoke shops and meeting the people who educate their customers about our products. In addition to the good memories we walk away with, we always enjoy asking the question of what we as a company can do to help make shop owners lives easier. The variety of feedback we get and insights into peoples businesses is always fascinating, but something that constantly came up was our little postcard, that we affectionately call the educard, a 4×6 postcard containing product information. 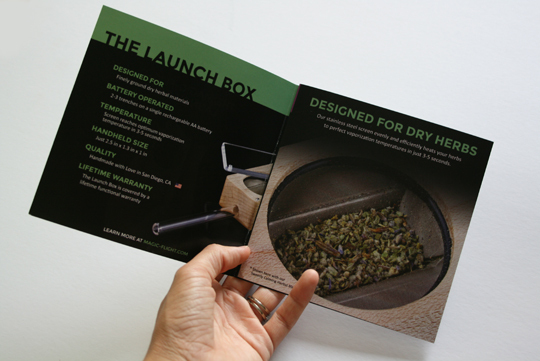 We loved hearing that this was something that enables shop owners to breath easier in their lives, so we took it to the next level, creating this 4 fold brochure outlining all the features of our most beloved product, the Launch Box. Our shipping team needed a way to distinguish between the old postcard (the edu-card) and the new expanded brochure, and the name “The Edu-Bro” was born. “Thank you for loving what you do! Thank you for keeping us healthy for more love & life! This entry was posted in Aphorisms, Behind The Scenes, Uncategorized by Magic-Flight. Bookmark the permalink.